The Tokyo Gas Group is committed to being a sound business enterprise, in which management and employees earn the trust of society by observing the highest ethical standards and exceeding public expectations in both the spirit and the letter of prevailing laws and regulations. To this end, the Group ensures compliance in accordance with established basic policies. Recognizing the importance of flexible and sustainable business activities in order to continuously adapt to changing business content and legal environments, the Tokyo Gas Group promotes collaborative cross-departmental efforts to strengthen compliance based on basic policies formulated each year by the Management Ethics Committee. 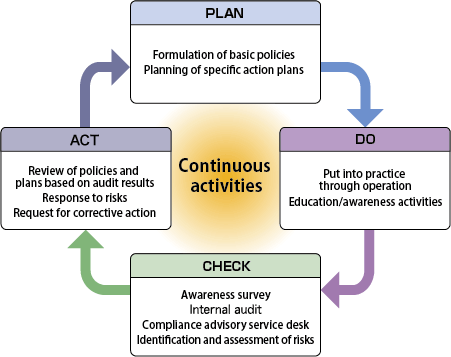 Under these basic policies, each department of the Tokyo Gas Group establishes and follows a PDCA cycle to review and improve its operations from the perspective of compliance. In addition, we pursue compliance by sharing the values and standards of conduct as stipulated in Tokyo Gas Group Our Code of Conduct. This code sets forth the values and standards of conduct for everyone who works at the Tokyo Gas Group. From fiscal 2003 to fiscal 2016, the code spelled out seven pledges. In fiscal 2017, however, the code was revised in the form of 11 pledges that incorporate international standards such as ISO 26000, the Olympic Charter, legal amendments and other key developments. 1．“Our Code of Conduct” sets forth the values and standards of conduct that everyone who works in the Tokyo Gas Group is expected to share and follow in order to implement our Management Philosophy and Corporate Action Philosophy and ensure a focus on compliance in business. 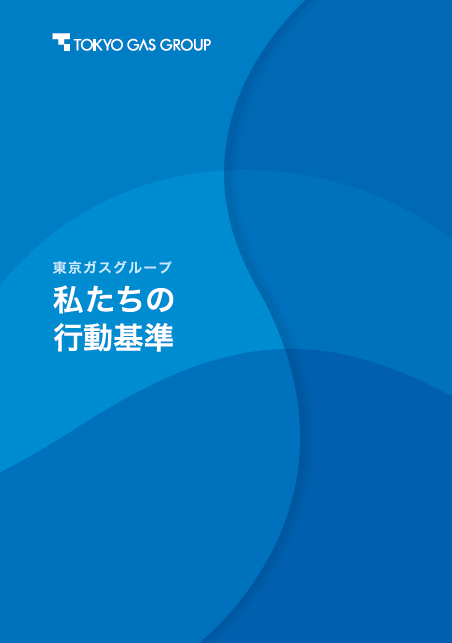 2．By following this Code of Conduct, we will contribute to the creation of an affluent society through the Tokyo Gas Group’s growth and development as a corporate group that people will continue to trust and make their first choice. 1．We will constantly think and act responsibly as individual members of this “energy frontier corporate group” so that people will continue to trust our group and make it their first choice. We will pursue continual innovation, unfettered by convention and ever sensitive to the expectations of customers, shareholders, and society. We will create the maximum outputs working in partnership with one another, while being fully aware of our individual roles and responsibilities and committed to self-improvement. We will put the customer at the heart of everything we do. Day in and day out, we will strive to build the “security,” “safety,” and “trust” that underpin the Tokyo Gas Group’s brand value. 2．We will constantly conduct business in a clear-cut and fair manner. We will constantly conduct business in compliance with laws, internal rules and regulations, and socially accepted rules. We will act swiftly to resolve issues where infringements of laws, internal rules and regulations, or socially accepted rules have occurred or may occur. We will not use our professional position for personal gain. We will not use company property for private purposes. We will enhance the transparency of business activities and actively and promptly disclose accurate information to customers, shareholders, communities, and other stakeholders in order to earn their trust. We will stand firm against illegal and improper demands made by sokaiya racketeers, organized crime groups, and other antisocial forces. We will not, under any pretext, give benefits to or otherwise accommodate the demands or interests of antisocial forces. 3．We will deal with customers, business partners, shareholders, and all our stakeholders sincerely and equitably. We will provide high value-added products and services that customers will make it their first choice. We will always put ourselves in the customer’s shoes in order to deliver the best possible work that exceeds customer expectations. In the event of a customer complaint or accident, we will respond swiftly and in good faith to prevent a recurrence. We will respect business clients and suppliers as business partners and do business with them in good faith. We will comply with the Antimonopoly Act and other applicable laws and ordinances, and will practice fair dealings in accordance with the principles of free competition. We will not exploit our position or authority to obtain undue benefit or make unreasonable demands. We will always be conscious of social point of view in our interactions with business partners, and will never commit any act that might cause misunderstanding or distrust from inside and outside the company. We will maintain fair relations and do nothing questionable under applicable national and local laws and ordinances in our dealings with government and other public officials and employees. We will promote understanding and observance of the Purchasing Guidelines for Business Partners by our business partners and others along our supply chains, and we will require partner businesses involved in transactions with those companies to observe the same standards. We will facilitate the appropriate exercise of shareholders’ rights through fair, timely, and appropriate disclosure and constructive dialogue. 4．We will respect diversity and individuality among our colleagues and create an inclusive working environment. We will respect human rights, prohibit child labor and forced labor, and not discriminate or harass anyone on the basis of race, nation, religion, gender, age, origin, nationality, disability, education, social status, sexual orientation, gender identity, or other such grounds. We will respect one another’s positions and treat everyone equally, irrespective of form of employment, gender, title, or any other differences. We will not commit sexual harassment, workplace bullying, pregnancy discrimination and other types of harassment, discrimination against employees who take family care leave, or any other acts that infringe the dignity of the individual. We will also not allow to condone such acts. We will enforce compliance, including adherence to all related laws and regulations, and make every effort to eliminate the risks of disasters and accidents in order to establish an excellent safety and health. We will create a lively workplace where everyone can realize their full potential and individual differences are respected. We will create an open workplace where everyone can share necessary information and engage in free expression and discussion. We will accept one another’s values and various work styles, and get the best from our own knowledge, abilities, and experience. We will also all work to raise productivity and meet the diversifying needs of society. 5．We will act for the protection of the global environment. As a leader in environmental management, we will reduce our environmental footprint and endeavor to make sustainable use of natural resources in every aspect of the Tokyo Gas Group’s business activities. We will promote use of highly eco-friendly energy sources centered on use of natural gas, and provide high-efficiency systems and equipment that have a low environmental impact. We will work with local communities to make people’s lives more environmentally friendly. 6．We will contribute to local communities and society as a good corporate citizen. We will respect and contribute to local communities, building trust with them through active dialogue and cooperation, and making effective use of our business resources. We will contribute to local communities as good citizens, recognizing that we ourselves are all members of communities. 7．We will handle information appropriately. We will handle confidential information obtained in the course of business properly and will not divulge such information during or after our employment at the Tokyo Gas Group. We will obtain and manage the personal information of customers, employees, and others by appropriate methods and use such information only insofar as permitted for legitimate purposes. We will not disclose personal information to third parties except where permitted by law. We will use information systems, including email systems and the Internet, in accordance with strict rules on proper use. Company information systems will not be used for non-business purposes. We will respect patents, trademarks, copyrights, and other intellectual property rights, protect and use rights held by our company, and not infringe the rights of others. 8．While conducting business globally, we will not only comply with national and local laws and regulations and respect international standards on human rights and similar issues, but also engage in business activities in a manner that is sensitive to different cultures, customs, and stakeholders’ concerns. 9．We will act with integrity and decency as members of society, and maintain high ethical standards in our private lives. In our private lives, too, we will comply with all applicable domestic and foreign laws and regulations, be aware of changes in social expectations, and always be mindful of how we should behave as a model citizen. We will not engage in insider trading, such as the purchase or sale of shares and other such transactions, using information obtained in relation to business. We will not communicate information or recommend transactions to other parties to enable them to make a profit or avoid a loss. In our private lives, we will not injure or deceive others, commit indecent acts, or engage in any other annoying or disturbing behavior. We will be careful to drink responsibly and will never drive under the influence of alcohol. We will always stop anyone who attempts to drive while drunk, and we will not encourage anyone who is driving a vehicle to drink and will not provide a vehicle to anyone who has been drinking. We will also obey all other traffic rules. We will not possess or use illegal drugs, and we will not be involved in any way in their manufacture, purchase, sale, distribution, or other such acts. We will never engage in any acts of gambling, including the betting of even small amounts of money on golf, mahjong, or sporting events. If communicating information via social media, we will not commit any act, even as individuals, that might harm the reputation or property of the company. 10．If we transgress this Code of Conduct or learn of a transgression, we will immediately report the matter to our workplace and rectify it. 11．Executives and managers will lead from the front and take action themselves. Executives and managers will themselves provide models of compliance with this Code of Conduct and encourage understanding and practice of the same throughout the workplace. Executives and managers will lead from the front in working to resolve any problem that may arise and ensure organization-wide action to prevent a recurrence. Executives will take strict action (including against themselves) where necessary.